US second home buyers are scoping out Europe this summer, with the UK, France and Italy enjoying the lion's share of their interest. According to InsureMyTrip, the three European countries will be the most popular destinations for travel beyond the US's borders between June and August 2015. "Our enquiry rate for the first half of 2015 is over 20% higher than for the same period in 2014. With a strong US dollar against the Euro, buyers from the USA have increased in numbers. Restored country houses remain the most popular choice but we've also seen a growing trend in townhouses, where buyers can enjoy the benefits of having shops, restaurants, cafés and local markets right on their doorstep." "Italy is a tourist destination enjoyed by visitors from all over the world and many of those hail from the US. Our two countries have ties that span centuries and modern-day Italy still holds many attractions for American visitors. We've found that many of those who come here are utterly charmed by Italy's attributes, from its stunning architecture to its beautiful beaches, as well as the local cuisine and the open, welcoming nature of regions like Le Marche." American Deb Gale, who owns a fraction in one of Appassionata's other properties, Casa Leopardi, describes the area as, "an astonishing combination of land, sea, sun and history, colliding with culture and casual sophistication. You cannot help but love the food, the wine, the restaurants and the markets." "We chose to go down the urban fractional route in order to offer owners a luxury property that had all the amenities they could wish for within walking distance. Many families prefer to stroll into town to find a restaurant for dinner and enjoy a glass of local wine, without having to decide who will be the designated driver on the way home. Or to let the children head to the local bakery for early morning pastries, while the adults keep a watchful eye on them from the roof terrace. 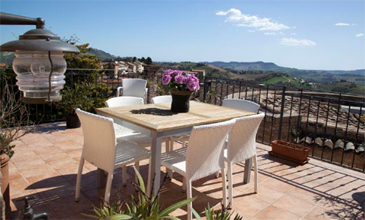 Casa Tre Archi enables all of this and more - it's the ideal holiday property in the ideal location. We knew it as soon as we first viewed it." Fractions in Casa Tre Archi are available from £75,000 for five weeks' exclusive use per year.